Comment: Deepest of all greens but even under little light they are never black. 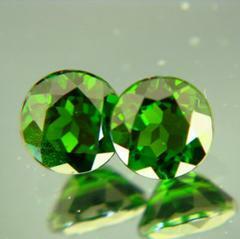 Durable all-natural gemstone variety that offers much on a budget. Hardly any inclusions visible even under lens. 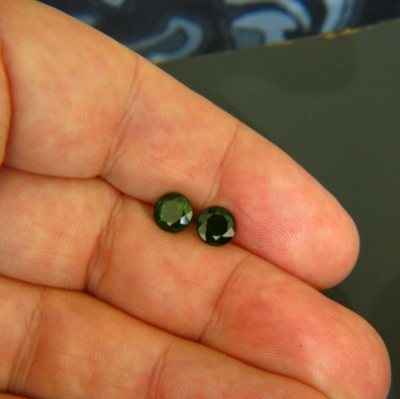 Less vivid than chrome diopside but also less expensive and not dull at all. No window. Set in studs or as side stones in a ring they will stand their ground against many cheap emeralds (especially those treated mutant-gems that will dissolve under warm soap) and against some demantoid garnets though it must be said that those are more sparkly if clean. Double AIGS reports. Free global shipping. Rescued rainforest and all WildFish extras included.